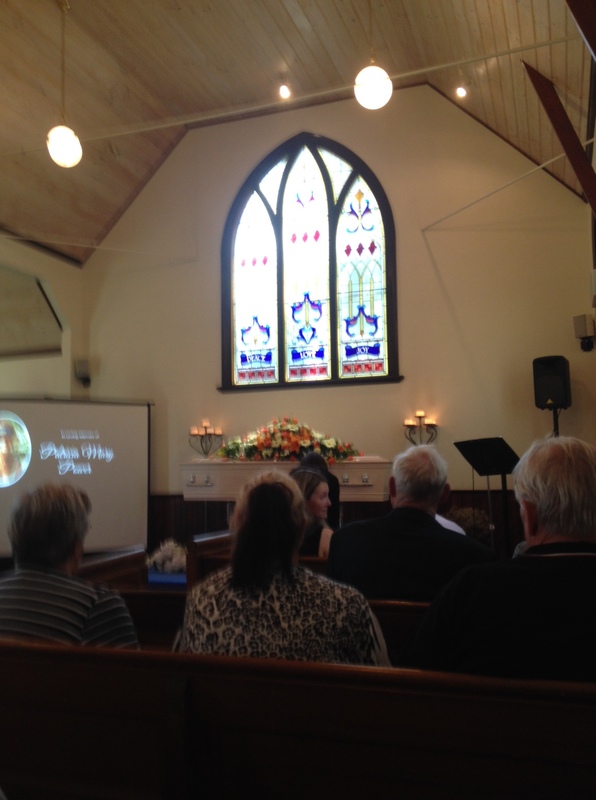 To have a celebration of a life that had ended inside a chapel used mainly for weddings was a somber but uplifting experience. It was heart breaking to know we would never see that person again, however, the poem on the handout explained why this courageous woman left us too soon. WhiteChapel Estate has a beautiful garden. The 19th century, historic, white weatherboard chapel is both elegant & charming. The beautiful chapel and grounds were a balm to the soul. The estate has a relaxed, elegant feel in an Australian bush-land country setting, yet is only 45 minutes from the City of Melbourne. With everything included in the one location, following the ceremony, friends and family were escorted to the “Terrace Room” and lawn area for refreshments and to share their favourite stories of a woman who had played a part in all our lives. This peaceful property is the perfect place to celebrate the beginning of a new life together or for a final farewell. 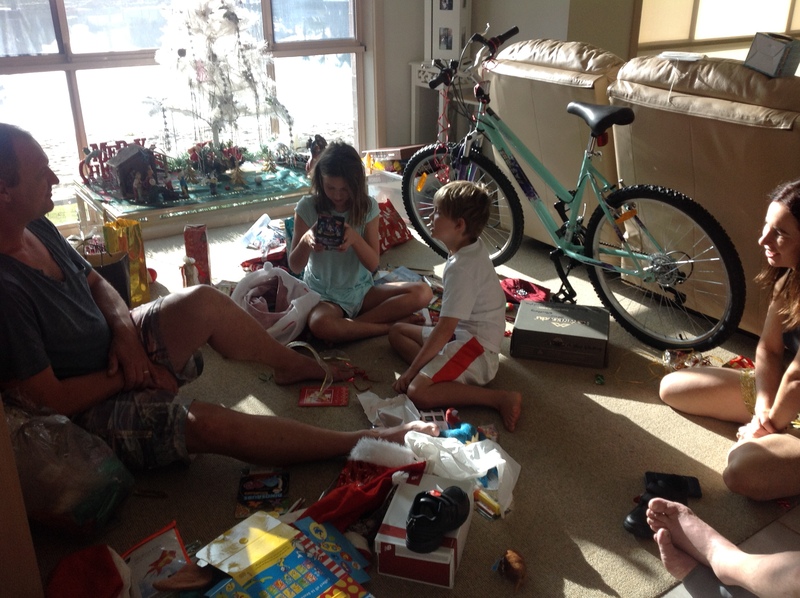 Christmas was filled with sun, sand and happiness and lovely gifts. We caught up with so many family and friends and Jason, Karen, Tahlia and Caxton were here for a very special Christmas morning. 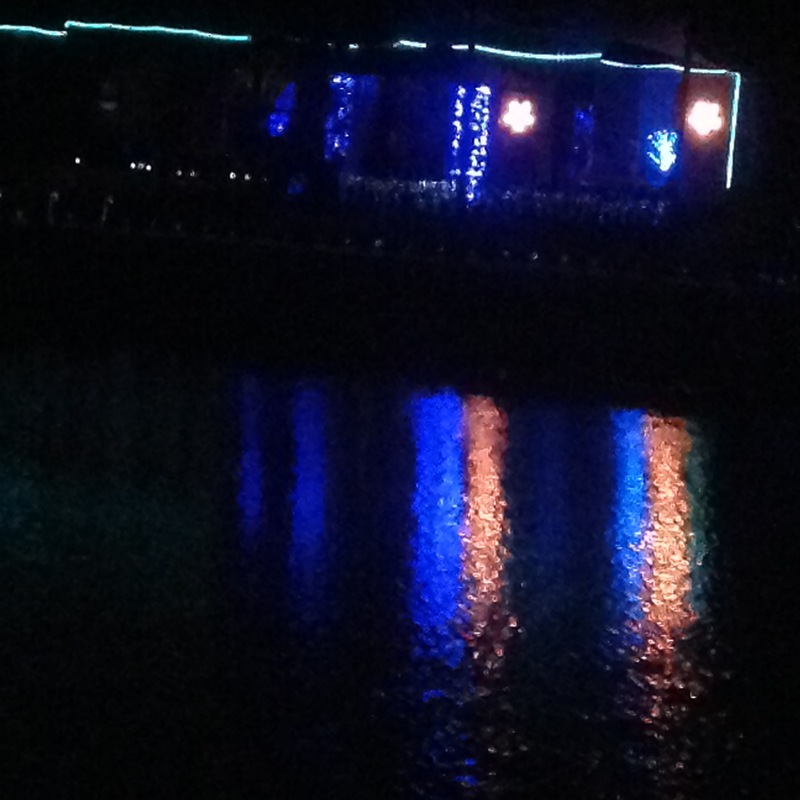 A night boat trip around the canals to see the Christmas lights was a highlight. Christmas morning the sun shone through the window and the seagulls made a racket hoping there would be some interesting treats later in the day. They were not disappointed. Santa bought bikes and under the tree were toys and games. Wrapping paper was quickly torn away to reveal hidden treasures. 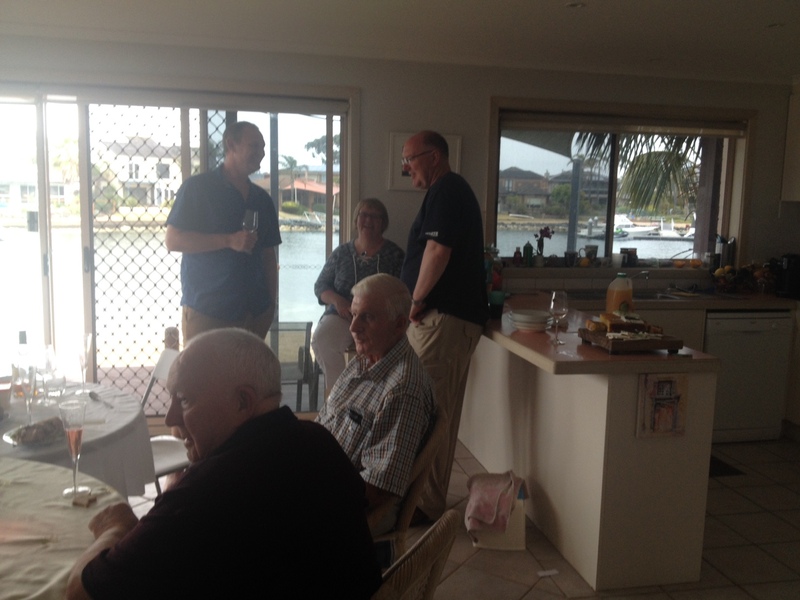 Boxing day both our sons and daughters -in-law were with us plus Alan’s sister, Betty, John , Carol-Anne and Margaret. 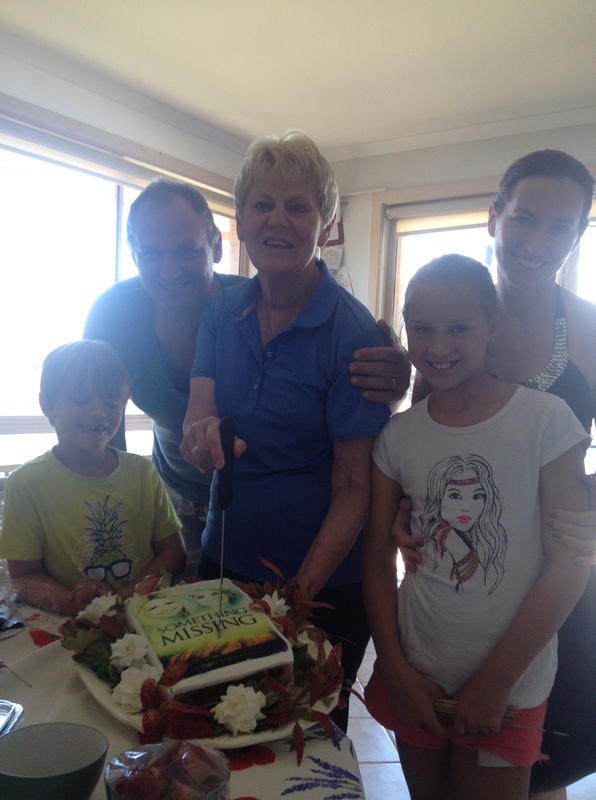 We cut the cake from my Book Launch. At the book launch on the 11th December Wendy Dunn presented me with a fantastic book-shaped cake with the front cover of Something Missing proudly displayed on top. I couldn’t bear to cut it so froze it to share with my Queensland family. New Years Eve we were caressed by the last rays of the evening sun and joined other families sitting on the sand to watch the sun slowly sink beyond the blue waters of Port Phillip Bay. Later, jet skis dashed past, well out of the way of the many swimmers enjoying the welcome coolness of the water. Children played cricket until it was too dark to see the ball while others enjoyed the swings, slides and other activities at the beach-side Keast Park foreshore playground. 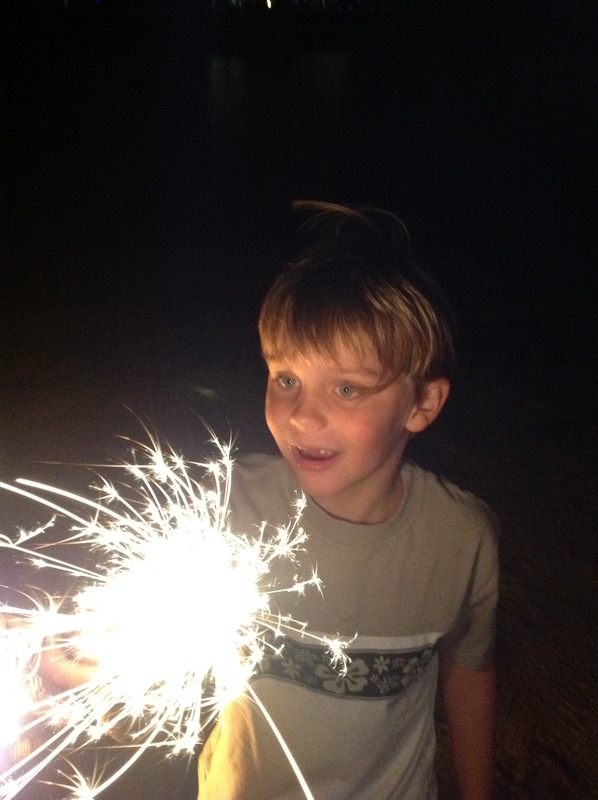 In the darkness at home we lit a brassier filled with pine cones, ran along the sand waving sparklers in either hand and popped party poppers. The multitude of colourful streamers covered our outdoor deck. 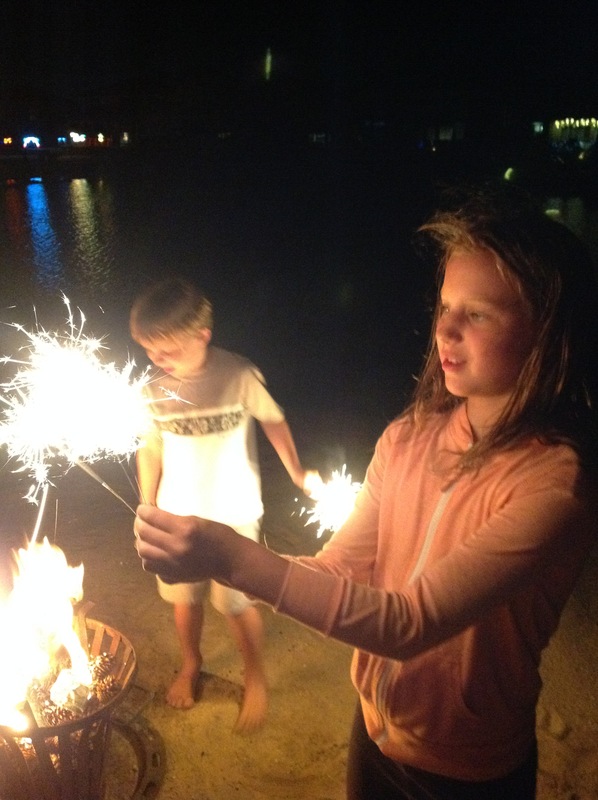 How wonderful to start a brand new year. It feels like opening a special new book with empty pages just begging for some interesting events to be recorded. 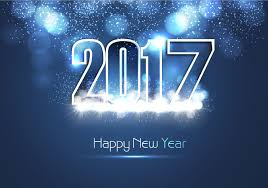 May 2017 be a year of fun, good health and happiness. With fingers crossed we all made New Year resolutions. Hopefully they will last…at least until February. Happy New Year to all fellow bloggers. May all your writing dreams come true in 2017.